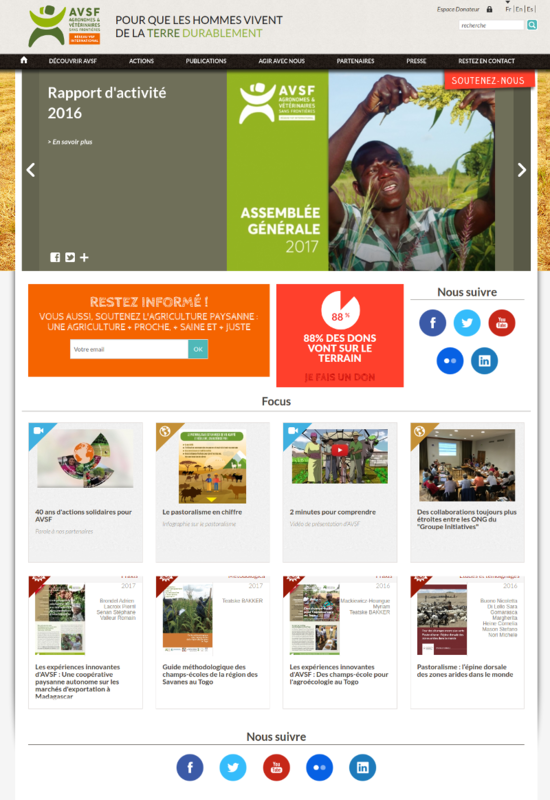 Agronomes et Vétérinaires Sans Frontières (AVSF) reaches out to smallholder communities threatened by exclusion and poverty, offering them professional skills in agriculture, livestock farming, and animal health. In this way, AVSF supports these communities as they strive to improve their standard of living, sustainably manage the natural resources upon which they depend, and contribute to the socio-economic development of their local area. AVSF helps them defend their rights and gain better recognition for the role they play in society. AVSF entrusted us with the realization of their new corporate website. This project lasted for about 3 months, with many interesting challenges in order to complete AVSF's demands and the graphic chart. Since the site launch, we already added many evolutions, in parallel with the development of AVSF conceptual "mini-websites", used to promote their donation campaigns. We love working with AVSF and they have trusted us with all of their internet presence.